(Photo Courtesy/Mike Beiermeister) A barn went up in flames out in Lachine on Monday night. 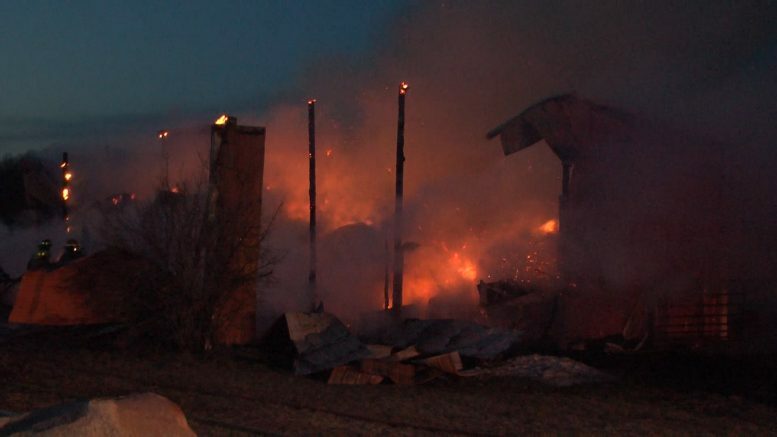 Lachine, Mich. — A barn went up in flames on 12648 Carney Rd. in Lachine on Monday. Firefighters responded to the call around seven. No one was injured in the fire. The barn was used for hay storage and had no electrical wiring. The owners had just been inside doing a walk–through. 51 minutes later the barn was fully engulfed. They do plan to rebuild the barn. Schuch is in the process of buying the farm from the current owners. A few barn cats were inside at the time of the fire. The owners were not sure if those cats were able to escape. Firefighters are still working to determine a cause at this time. Wilson Township, Green Township, and Long Rapids Township Fire all responded to the call.